I'm not a brand whore. That is to say that I don't just buy something because it has a name attached to it. I need to truly like something regardless of the name on it prior to laying out hard earned cash for it. That said, I don't mind paying a little extra for something that I know will be classic and last a long time, even if it has a brand name attached. 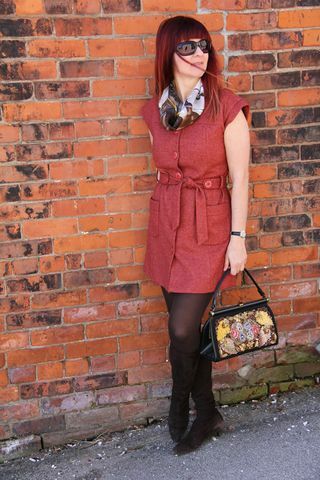 This rust jacket is from Anthropologie and though the brand is not so well known, Tabitha, the quality, classic cut and style are all top notch. 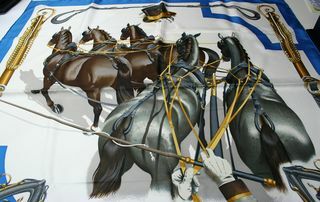 The Hermes scarf was a present from my husband and has stunning chocolate horses on it with a royal blue border. This is one of those pieces I will put in my will for one of my nieces, it's just that special. 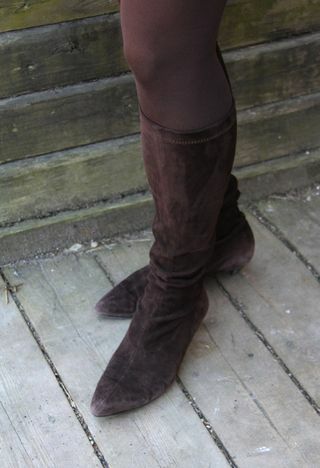 The boots were bought on a shopping trip to NY at the famous Woodbury Common in New Jersey. I got them at Saks. They are probably the best boots I've ever bought. Regular price I think was around $800 I paid around $350. They were a splurge at the time but well worth it in the end. I've worn them time and time again. They go on like socks with a little heel. So comfortable. It's rare when you can find something that stylish and that comfortable that goes with literally everything you own. 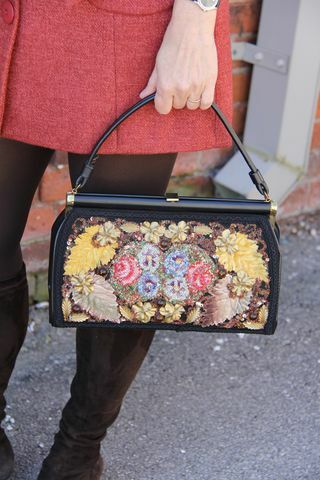 The purse, well that was a little vintage find recently. It didn't cost lots, but it really makes a statement and I know that it too will never go out of style. No, it's not a special brand but I love it. When you are choosing items for your closet, paying attention to fit, style, color, how much an item suits you and how much you love it is far more important than promoting a brand.